In this lab, I will show you how to configure the Cisco PIX 515E Firewall. Instead of dumping a lengthy configuration and provide some explanation to it, I will do it a little bit differently. The Cisco PIX Firewall 515E has six FastEthernet interfaces: ethernet0, … ethernet5. The Internal netowrk (LAN) has a subnet IP address of 10.0.0.0/24. This is on ethernet0. The interface will have IP 10.0.0.254. The External network (WAN) has a public IP subnet address of 216.123.169.0/24. This is on ethernet1. The interface will have IP 216.123.169.99. Ethernet2: used for DMZ2 and is assigned an IP subnet of 192.168.20.0/24. The interface will have IP 192.168.20.254. Ethernet3: used for DMZ3 and is assigned an IP subnet of 192.168.30.0/24. The interface will have IP 192.168.30.254. Ethernet4: used for DMZ4 and is assigned an IP subnet of 192.168.40.0/24. The interface will have IP 192.168.40.254. Ethernet5: used for DMZ5 and is assigned an IP subnet of 192.168.50.0/24. The interface will have IP 192.168.50.254. Task 1: How to enable all six interfaces? First, we need to set the speed for the interfaces to be auto, then we name the interfaces and assign security numbers to them. Security number is a number ranging from 0 to 100 with 0 being completely untrusted and 100 being completely trusted. Any number in the middle have different trusted level depending on how low/high the nunber is. The higher the number, the more security it has. This means that an interface with security of 20 is a less trusted network than that of an interface with security number of 30. Task 2: How to enable Internet access for LAN (Internal netowrk)? The GLOBAL and NAT commands are what allow access from the HIGHER SECURITY subnet to the LOWER SECURITY subnet. GLOBAL is applied to the LOWER SECURITY interface and NAT applies to the HIGHER SECURITY interface. The last command indicates that we allow Internet connection through next hop of 216.123.169.1. We can enable DHCPD on the LAN interface as well as the DMZ interfaces. Now try to hookup a computer to ethernet1 (internal network), a local IP address should be assigned to it by the DHCP server on the PIX firewall. Try to browse the Internet. You should be able to browse at this point. The red text is optional if it has already been typed in the inside interface section. Launch your favourite browser, type: whatismyip.com in the browser to obtain the public IP address for your Internet connection. It should be 216.123.169.99. Task 5: Assign / map a public IP address to a host inside the internal network. I hooked up and PC to the internal network (LAN) and the PC obtained an IP address of 10.0.0.50. I would like to map a different public IP address (216.123.169.100) to this host. This means that every time this PC access the Internet, it is known as 216.123.169.100. People from the Internet can reach this PC via 216.123.169.100. Testing: Open your favourite browser and access whatismyip.com, your IP should now be 216.123.169.100. Additionally, I have allowed traffic to the RDP port so that anyone on the Internet now may connect to the internal PC via the IP address of 216.123.169.100. Note that the access list number is 110. There can only one access group bound to an interface at a time. After that command, test to ensure pinging from the Internet is OK.
Now ensure that the access-group command is in place. The following commands erase the PIX configurations and restarts the device. Privilege 15 is administrative privilege. The first password is the user mode access whereas the second password is the manager password used to allow management of the firewall. Task 11: Where is DMZ2 interface physically? On the left most interface, looking from behind. When you check whatismyip, it should show 216.123.169.99. Task 12b: Assign 216.123.169.105 to a host on DMZ2 network. In this task, I will enable SSH from the Internet. Users from the outside world can SSH into my PIX firewall at 216.123.169.99 which is the WAN (outside) interface). Step 1 is to check to make sure that 3DES is enabled on the Firewall. Please do not consider using DES as DES is just a bit stronger than clear text, but not secure. 3DES is much more secure to use for VPN. This PIX has an Unrestricted (UR) license. Step 2 is to check and see if there is any VPN configuration exists on the firewall. encryption algorithm: DES – Data Encryption Standard (56 bit keys). If there is only a Defaule protection suite policy, it means there are no VPNs configured. Allow IPSec connections to the PIX. Now we have to configure ISAKMP policy on the PIX firewall. Now we need to define pre-shared key for the connection. (Pre-shared key is G3tm3!n and 2.3.4.5 is the IP address of the peer). Now we will setup the actual connection, the crypto map “myvpnmap” with 2.3.4.5 as the IP address of the peer. Packet matching (interest traffic) access list myvpn. Any traffic that match this access list should go through the VPN tunnel. Last, we will tell the PIX NOT to use NAT for packets that traverse through the VPN but to ROUTE them instead. Now on the other side (peer) you can go ahead to configure an RV042 router to connect to the VPN. Define the access list to enable split tunneling. Define the access list to avoid network address translation (NAT) on IPsec packets. Create a pool of addresses from which IP addresses are assigned dynamically to the remote VPN Clients. Disable NAT for IPsec packets. Permit packet that came from an IPsec tunnel to pass through without checking them against the configured conduits/access lists. Define the transform set to be used during IPsec security association (SA) negotiation. Specify AES as the encryption algorithm. Create a dynamic crypto map entry and add it to a static crypto map. Bind the crypto map to the outside interface. Enable Internet Security Association and Key Management Protocol (ISAKMP) negotiation on the interface on which the IPsec peer communicates with the PIX Firewall. AES as the encryption algorithm. The configurable AES options are aes, aes-192 and aes-256. Note: AES 192 is not supported by the VPN Client. Create a VPN group and configure the policy attributes which are downloaded to the Easy VPN Clients. We can name and group related objects together in order to make the firewall configurations cleaner. 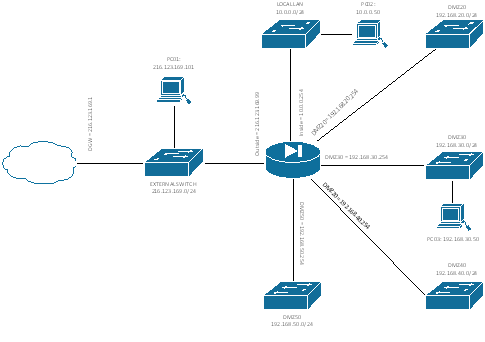 Task 21: Forward PPTP VPN traffic. Behind the firewall (on the Inside interface connected to the LAN switch) we have a PPTP VPN router. The LAN port of the PPTP router will have IP address of 10.0.0.4. Enter the correct commands on the PIX to allow PPTP traffic to be forwarded to the PPTP box.